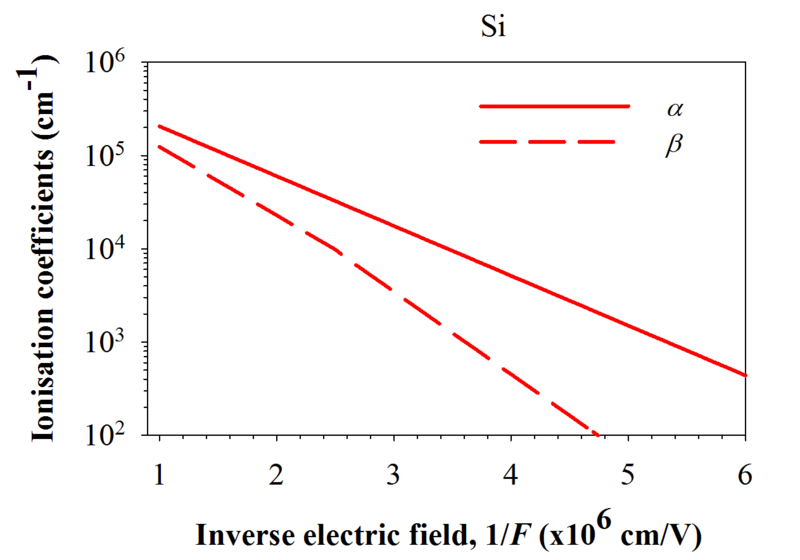 The figure shows the impact ionization coefficients for the group IV semiconductor material, silicon (Si), as a function of inverse electric field at room temperature. These ionization coefficients were obtained from photomultiplication measurements undertaken on a range of PIN and NIP diodes of different avalanching widths. where F is electric field strength. The constants A, B and c are tabulated as below. α(β) can be can be used in simple analytical expressions to determine the avalanche multiplication (or gain) and the breakdown voltage. In thin avalanching structures, α(β) overestimate the multiplication as they ignore "dead-space" effects. They also cannot accurately predict the excess noise due to the impact ionization process. Models to predict the multiplication and excess noise in thin avalanching structure require knowledge of enabled ionization coefficients, α*(β*). The above data is from Overstraeten and Man5 Details of ionisation coefficients over a wide electric field range can be found in Cheong et. al.1 for silicon and other popular semiconductor materials.